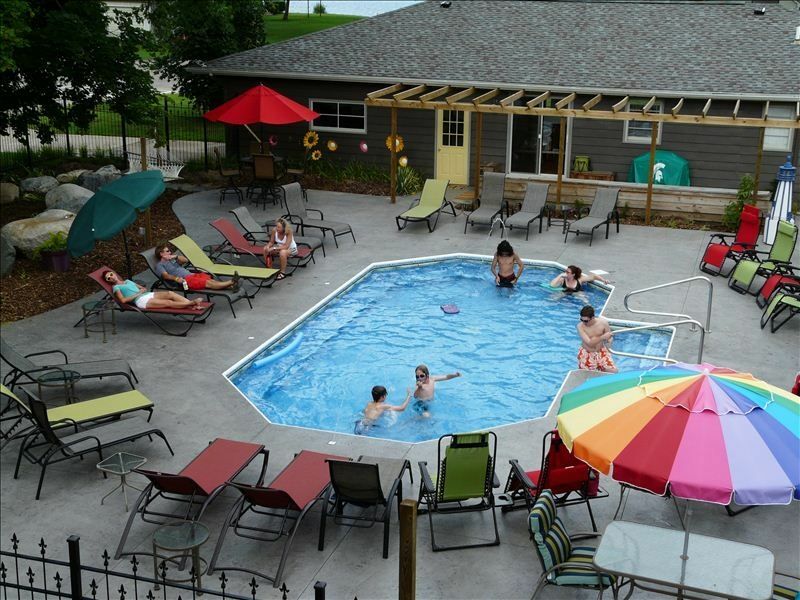 Unit #1 is located on the first floor with easy access to the pool and hot tub area. King bed in the bedroom, 2 sleeper sofas in living room to sleep 6 total. beautifully remodeled bathroom with jack and jill tempered glass vessel sinks add a feeling of luxury to the bathroom in unit 1.
fully stocked and ready for your stay. fully remodeled with state of the art appliances, granite countertops and wood floors. granite countertops, a saltwater pool, a wrap around porch, private laundry facilities, use of the pool house, bar and hot tub. upon booking, you will receive an email packet with all the instructions you need for your rental. The reservation is only secured when the rental fee is paid and the rental contract is signed (including the credit card for our files on the last page.) you will only get the code for the lock when we receive the completed rental agreement. All guests are expected to leave the property as they found it, this includes washing all dishes, linens used, removing all garbage, food and other items not on the property when you arrived. anyone failing to comply will be assessed a charge for cleaning. no persons not on the contract are permitted on the premises or to use the pool/patio/hottub area. failure to follow this rule will result in immediate dismissal from the property without refund. Overall we enjoyed our stay. The pool was nice since it was a hit weekend. Had some issues with Wi-Fi. The condo was big and close to Douglas. Girls getaway weekend. Very close to Main Street Douglas. Property was great and spacious. We liked the patio set, pool, hot tub, & lush plants around the property. This was a lovely little place in Douglas. I will give you a list of pros and cons and let you decide for yourself if you want to stay here. Condo was in excellent condition, amenities were great (although it was a bit cold to try the pool...), and Sarah was helpful and easy to work with. Great stay! Very unique property. Updated unit and very comfortable setting. Easy walk downtown with a quick trip into Saugatuck. We were visiting for a girls weekend and what a great place to have it! The property is so cute and colorful. We stayed in unit 1, it had the front porch and deck to the side for outdoor fun. There were two other parties happening during the weekend and we didn't hear anyone the entire weekend. The pool is on the smaller size, but even with the large party in the pool house it seemed to be just right. I loved our stay here and I hope to return next summer. Last day clean up was a little bit of a pain since we were sitting around waiting for the dryer to stop so we could fold up the towels, it would be great if that wasn't a chore for the renters.